Physical copies of Storyteller are available for pre-order at Amazon.ca here: http://smarturl.it/amzstoryteller. The album’s first single, “Smoke Break,” is available for sale at http://smarturl.it/cusmokebreak. About Carrie Underwood: Carrie Underwood emerged from the promise of her 2005 American Idol win to become a true multi-format, multi-media superstar, spanning achievements in music, television, and film. A seven-time GRAMMY® Award winner, she has amassed nearly 100 major honors, sold more than 56 million records worldwide, and recorded 21 #1 singles, 11 of which she co-wrote. The first female artist to be twice named the Academy of Country Music’s Entertainer of the Year, Underwood was recognized as Pollstar’s top female country touring artist for her headlining tours in 2008, 2010, and 2012. Her four studio albums, Some Hearts, Carnival Ride, Play On, and Blown Away – each certified multi-Platinum or Platinum, and each an American Music Awards winner as Country Album of the Year – tallied 38 weeks at #1 on Billboard’s Top Country Albums chart with songs that have been streamed more than 1.4 billion times worldwide. In 2013, she starred as Maria von Trapp in NBC’s three-hour holiday blockbuster, the Emmy®-winning The Sound of Music Live!, whose airings attracted 44 million viewers. In late 2014, the Grand Ole Opry member released her first hits collection, Greatest Hits: Decade #1. Celebrating her first 10 years of music, the 25 songs included two new hits co-written by Underwood: the Platinum-certified, GRAMMY-winning “Something in the Water,” as well as the #1 smash “Little Toy Guns,” with the album recently touted by Billboard as the best-selling hits album of 2015. In August, Underwood amassed 4.5 million in new Recording Industry Association of America (RIAA) Gold & Platinum certifications to become the current top country artist on the RIAA’s Digital Single Ranking (with certifications of 28 million across 20 songs). In September of 2015, she begins her third season as the voice of primetime television’s #1 program, Sunday Night Football, and on November 4, she’ll return for an eighth consecutive year as co-host of the CMA Awards. 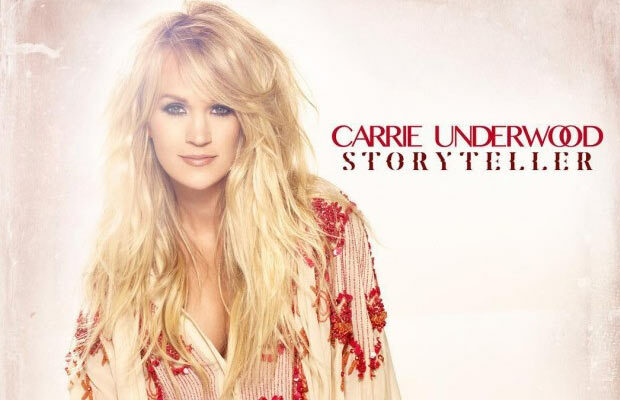 Underwood is at radio now with her record-breaking single “Smoke Break,” the first single released from her fifth studio album, Storyteller, out worldwide on October 23, 2015.